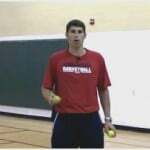 Archive "Wall Tennis Ball Basketball Dribbling Drills"
Wall tennis ball basketball dribbling drills are a great way to improve a players ball handling and hand eye coordination. Tossing the tennis ball against the wall will help to simulate the partner tennis ball toss drills, but it will also add difficulty to the drill. 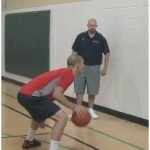 These drills are going to help the player develop their handles, but also their hand eye coordination. So even if the player is not a primary ball handler, the wall tennis ball drills listed below are great for developing their hands. 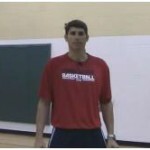 All of these wall tennis ball basketball dribbling drills are instructed by one of our expert basketball coaches, and then demonstrated by a high level basketball player. All of the basketball drills also comes with high quality video and written instructions covering the tips and pointers for the drill. Wall tennis ball drills are more advanced ball handling drills than most, but they can be really good for helping your players to develop really quick handles and hands. This is especially true if it is a coach that is tossing the tennis ball against the wall, because the player must make the move quicker than they normally would. They will continue to challenge themselves and over time become a lot quicker with the ball. These drills are great for non ball handlers as well. Most post players struggle to catch the ball in the post, especially if it is a sub par pass. Well these wall tennis ball drills are going to train your post players hands to move quicker and be softer on the catch. After a while you will recognize that they are able to catch the basketball a lot easier and don’t fumble passes anymore. 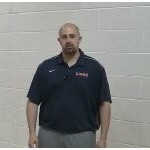 If you are looking to improve your hand quickness and overall ball handling than these are the basketball dribbling drills that you are looking for. Tossing the tennis ball against the wall is going to challenge you to make the move with the basketball a lot quicker than you normally would, and the harder you toss the ball the quicker you must move your hands. Gradually as you continue to do these drills during your basketball training time you are going to really notice the improvement in your hand quickness, and you will be surprised at how fast your hands are starting to move. 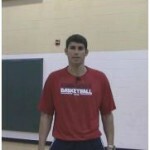 The wall tennis ball basketball dribbling drills below all require a Pro Membership to view. Sign up for a free 7 day Pro Membership Trial and get full access to the website and our complete database of 1,000’s of basketball training videos. This is not your typical basketball dribbling drill but it is still a great ball handling drill because it works on multiple things at the same time. This wall tennis ball toss basketball dribbling drill is a great way to work on your handles as well as your hand eye coordination. 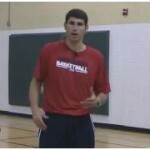 This basketball dribbling drill is great for developing hand strength and ball control. It is also going to work on the in and out dribbling move. This is a beginner wall tennis ball toss basketball dribbling drill and it is really good to help players work on dribbling a basketball without having to look down while doing it. This weak hand dribbling drill is going to incorporate a partner, tennis ball, and a wall. It will work on developing soft hands, and hand eye coordination. This wall tennis ball dribbling drill is going to work on a specific move, but also the players hand eye coordination, and dribbling with eyes up. The wall tennis ball crossover dribbling drill is going to help the player work on their quick handles and hand eye coordination. The wall tennis ball toss between the legs basketball dribbling drill will help you develop quick hands and make you a better ball handler. This wall tennis ball basketball dribbling drill will help you improve your handles and hand quickness because you will have to do two things at once. This is a great tennis ball basketball dribbling drill to help improve your handles and your hand eye coordination regardless of what position you play. If you are looking for a great way to improve your handles and work on your hand eye coordination this is a great basketball dribbling drill to use. This reaction drill is going to use a tennis ball and a wall to help the player develop quick and soft hands for catching the basketball in the post. This is not your typical behind the back dribbling drill because it is going to also involve a wall, tennis ball, and a partner. This is not a typical reverse between the legs dribbling drill because it is going to incorporate; a partner, tennis ball, and a wall. This dribbling drill is going to incorporate a tennis ball and a wall to help the player work their reaction time, and developing quick hands. This wall tennis ball basketball ball handling drill will help you to work on the behind the back move and make your hands quicker with the basketball. If you are looking for a great drill to improve your basketball ball handling and test out your hand quickness this is the drill for you. This is an advance wall tennis ball toss basketball dribbling drill but if you are looking to work on your combination dribbling moves it is a great dribbling to use. This crossover basketball dribbling drill will help you work on using the crossover as part of a combo move. It will also help improve your over all handles. This combo move basketball tennis ball dribbling drill is designed to work on your handles, combo moves, and your hand eye coordination. This is an advanced tennis ball dribbling drill that will not only work on your handles but also your mental conditioning by making you remember which move comes next. 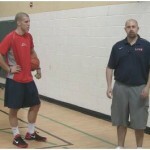 The rhythm basketball dribbling drill will not only help you work on your handles and make you a better dribbler but it will also help you to practice thinking while you are handling the basketball.